We have multi vendor competence available for providing above services across the country and outside India as well. Microqual provides these services through both in house and through certified partners from OEMs. The competence available is across technology for 2G, 3G and WiMax. All teams are fully equipped with tools and test equipments and safety equipments. 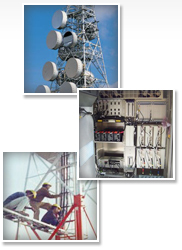 Microqual is the only company to offer above services along with supply of RF products at site (feeder, Mechanical and Electrical kits) to offer as composite services to streamline site management, Zero defect and NIL wastage from customer perspective as Microqual offers both products and services to its customers.